How to position Eclipse Dialogs and Messages at ceter of screen. Eclipse + CVS + JIRA is all i need for my development team. Boss 3 : Bad BOSS can make you quit! MyEclipse 6.0 GA has been released in August 2007 with a some cool features aiming at developers productivity. I just downloaded their 30 day trial version and played around little bit for two days. I was developing a AJAX and SOAEclipse IDE for my client; i was particularly interested to look into the ajax and database capabilities from MyEclipse. 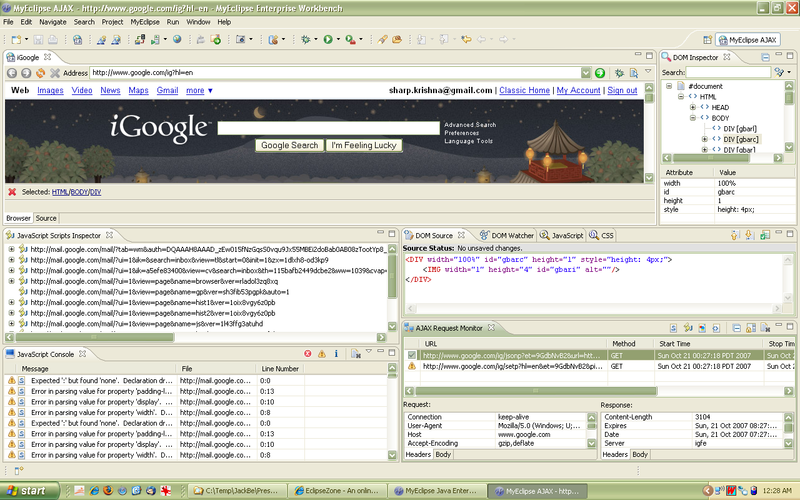 Ajax debugging capabilities are awesome from MyEclipse. They tried to provide most of the capabilities from the Firefox’s FireBug. Ajax Request Monitor is another great tool to see how many ajax requests are happening on the page. It also shows the Request/Response along with Headers and Body. This is very helpful for debugging any kind of ajax requests to indicate time, status and request and response. DOM Source view is very useful to see the code for a selected DOM node. The DOM Inspector view enables the developer to select any node on the dom and it highlights the specific area in the WebPage. This is great feature for the developer as he can see and inspect the inner elements from DOM. I found the Java Persistence Perspective is very useful with DbBrowser, Table/Object Info, SQL Editor, Results, and Table Edit capabilities. How cool is it for a developer to be able to connect to different databases (via DB Browser), select the tables and view the table Info (via Table/Object Info) and the edit the tables if needed (via Edit Table). 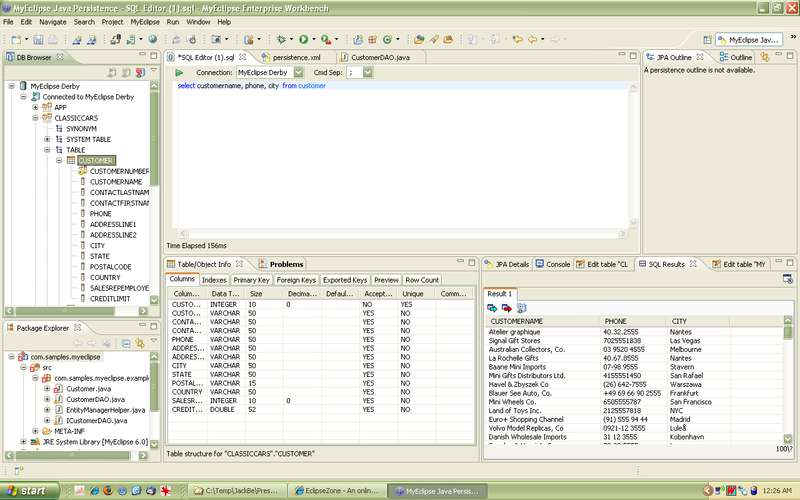 SQL Editor allows to select the different data base connections and then execute the query on a specific table or view. The query results are displayed in the SQL Results view. A developer oriented feature is to be able to copy the results on to the clipboard. I really liked the ease with which we can add a capability; some of the capabilities include Add Web Service Capabilities, Add Tapestry Capabilities, Add Struts Capabilities, Add Spring Capabilities, Add JPA Capabilities, Add JSTL Capabilities. All these capabilities can be added by a single click. Configuration files and property files are automatically generated for the developer. Java Persistence perspective enables to be able to select a table and create code supporting the persistence capabilities. Persistence mechanisms like JPA, Hibernate and EJB3 are supported via this feature (they call it reverse engineering… from table to code). Last but not the least, Installing the MyEclipse examples dynamically is a great feature. User can decide what he wants and then he can get a full running application. I really like the bundling of the Tomcat and Derby so that all the minimal set of pre-requisites are satisfied. Overall, working on MyEclipse was a great experience for me. All the mentioned features definitely improve developers productivity to a greater extent. This entry was posted on October 23, 2007 at 6:24 am	and is filed under Eclipse, Hibernate, Java, Plug-ins, Plugin, Uncategorized. Tagged: debugging, Eclipse, myeclipse, persistence, web2.0. You can follow any responses to this entry through the RSS 2.0 feed. You can leave a response, or trackback from your own site. Ya, i know that these capabilities are present in the ATF. My comments and observation about MyEclipse is only about the “MyEclipse” packaging. In reality, i do use the ATF and WTP in cmbination for an RCP that i am developing. Glad you guys are interested in our Ajax tools. We do indeed integrate most of ATF as it is a very solid framework for Ajax tooling (kudos to ATF team). However, for MyEclipse we had to modify it heavily with fixes and additional MyEclipse specific enhancements, plus a couple of brand new features rolled in as well. We would love to hear what you guys think over at our forums.